We’ve found the perfect shop to raid for that upcoming baby shower and it’s packed with honest-to-goodness stuff. Founded by Jessica Alba and Christopher Gavigan, the brand aims to provide safe, eco-friendly, beautiful, convenient, and affordable baby products to doting parents. 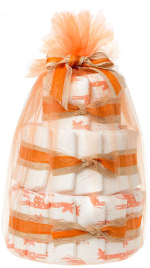 And we tell you, all this good stuff look equally adorable – like The Honest Co.’s mini diaper cakes! 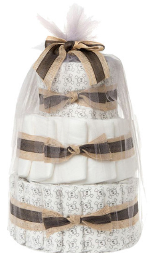 The brand’s Mini Diaper Cake is packed with ultra absorbent, eco-friendly diapers that are extra soft, hypoallergenic, free of chlorine processing and risky additives (like fragrances, lotions, and latex). It comes in 5 lovely cake styles: Home Run, Busy Bees, Rhythm & Blues, Baby Rockstar and Safari. Each cake style consists of The Honest Co.’s Premium Eco-Friendly Disposable Diapers in very cute prints. 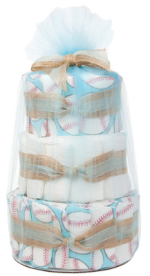 The Home Run diaper cake makes use of the Baseballs print and White, while Busy Bees combines Bumble Bees and Daisies prints. 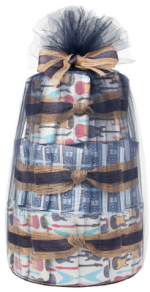 The Honest Co.’s Premium Eco-Friendly Disposable Diapers in Boomboxes and Guitars take center stage in the Rhythm & Blues diaper cake style. Baby Rockstar rocks Skull prints and White, while Safari gets you Giraffe prints and White. Tucked inside are 5 essential baby care items made with non-toxic, natural, and safe ingredients: Shampoo + Body Wash, Face + Body Lotion, Organic Healing Balm, Laundry Detergent and Wipes. These adorable mini diaper cakes are custom-made so a lead time of 1 to 3 days applies, before orders are shipped. Interested? Check out more honest-to-goodness products by clicking the banner below.